Top row: Green Hasson Janks Accountants studio auditor Ilan Haimoff; Film festival consultant Steve Montal; UCLA Professor and Associate Dean, Entrepreneurship, Barbara Boyle; Chairman of The Walt Disney Studios Alan Horn; USC Associate Professor and MBB4 editor Jason E. Squire; Gersh Agency Executive Vice President, Business Affairs, Stephen M. Kravit; President, Warner Bros. Pictures Worldwide Marketing, Blair Rich; President, Global Strategy & Business Affairs, RRKidz, Inc., Linda Benjamin. Bottom Row: Screen Engine/ASI Founder and CEO Kevin Goetz; President, UniFi Completion Guarantors Steve Mangel; Producer (including two Sundance 2016 premieres) Eric B. Fleischman. 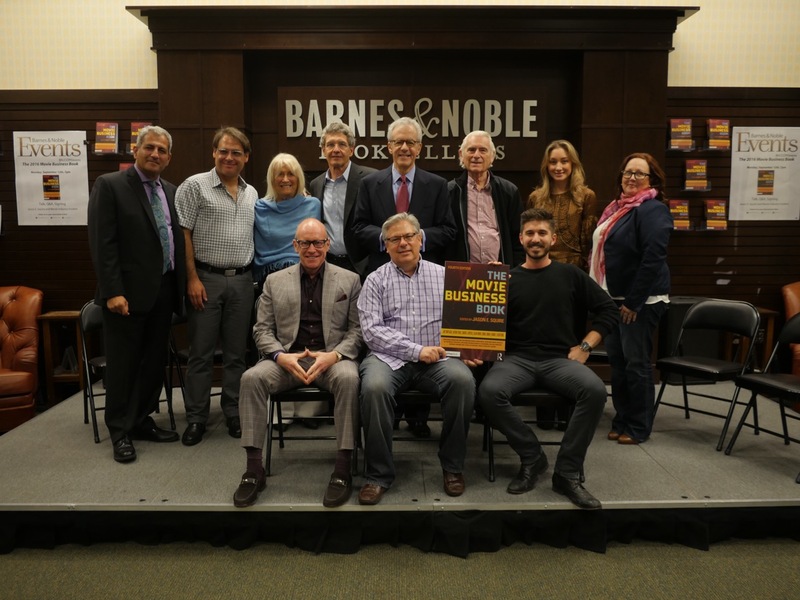 On September 12th, Barnes & Noble at The Grove in Los Angeles hosted the launch of The Movie Business Book Fourth Edition, published by Routledge/Focal Press and edited by USC School of Cinematic Arts (SCA) Associate Professor of Practice Jason E. Squire, who moderated a panel of his book participants. The event delivered high-level executives featured in this textbook, from a cross-section of business models: the studio model, the independent model, and the DIY micro-budget model. These included Chairman of Walt Disney Studios Alan Horn and President of Warner Bros. Pictures Worldwide Marketing Blair Rich. The evening’s format featured a lively Q & A with audience members. Topics covered diversity in films, technology disrupting the business, micro-budget opportunities and the growing influence of China. One highlight was the biplay between WB’s Blair Rich and Screen Engine/ASI Founder Kevin Goetz on the impact of market research and the continually fragmenting movie going audience. Squire’s longstanding research helped establish “movie business” as a distinct area of academic study. Prior editions of The Movie Business Book are used at universities all over the world, with translations in Spanish, German, Korean, Japanese and Chinese (translated by scholars of Beijing Film Academy where Squire was a Visiting Professor). Squire collaborated closely with each participant in his role as curator, co-writer and editor. The Movie Business Book includes first-hand, insider accounts as primary references involving negotiations, management decisions, workflow, business models, dealmaking, global distribution (from micro-budget to studio tentpole), studio accounting, release patterns, revenue streams and more. The first half of the book describes expenses, money being spent; the second half tracks revenues, money coming back. Notable book highlights include chapters by independent filmmaker and actor Jay Duplass (The Puffy Chair, Safety Not Guaranteed); President of Marvel Studios and producer Kevin Feige (every Marvel movie since Iron Man); producer and recent SCA grad Eric B. Fleischman (Sundance 2016 selections Carnage Park, Sleight); David S. Goyer (Batman vs. Superman, The Dark Knight trilogy); director Doug Liman (Swingers, Bourne Identity, Edge of Tomorrow); President of National Amusements Shari E. Redstone; President of Warner Bros. Worldwide Home Entertainment Ronald J. Sanders; online self-distribution guru and VHX.TV Co-Founder/CEO Jamie Wilkinson. Other book participants who spoke at the event included CEO of Compliance Consulting Rob Aft; President, Global Strategy & Business Affairs, RRKidz, Inc. Linda Benjamin; UCLA Associate Dean, Entrepreneurship Barbara Boyle; Green Hasson Janks Accountants Partner Ilan Haimoff; Gersh Agency EVP of Business Affairs Stephen M. Kravit; President of UniFi Completion Guarantors Steve Mangel and film festival consultant Steve Montal.